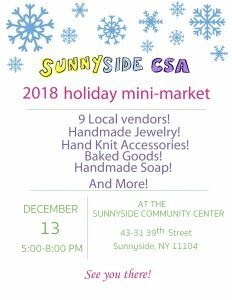 A free event for CSA members and non-members too! It’s a great chance to learn more about the CSA, plus you can sign up at the event to guarantee a spot in the Summer Shares. Bring a friend, the more the merrier! This is your chance to ask questions, meet vendors and volunteers that organize the CSA, and get first dibs on Summer Shares to guarantee your spot! 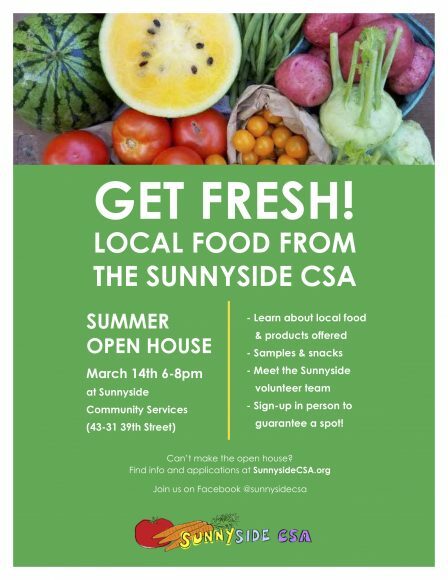 Feel free to invite anyone interested in learning more about the Sunnyside CSA. Shop the Holiday Market, One Day Only! We’re so excited for this year’s holiday market, full of fun (and tasty) things from local vendors–but it’s only here for one day! Find gifts for everyone (and yourself too!). Shop tomorrow, any time from 5:00-8:00pm. It’s full-swing into December, and our holiday market is only 10 days away! Stop by and shop from our wonderful, local vendors–featuring handmade jewelry, accessories, baked goods and more. Come check it out December 13th from 5:00-8:00pm (same time as Winter Share pickup).